Do you have a creative little girl in your life? I do and have found another adorable gift for her thanks to SmitCo. Quality, affordable gifts for girls ages 2 to 12. SmitCo products include rose gold, gold or rhodium plated jewelry and sets, as well as very popular stretch sets for little girls - all packed in cute gift boxes. SmitCo also has several different diaries with lock and keys and diary sets for girls, as well as several different temporary tattoos sets to provide hours of fun. A huge hit is the Emoji themed nail art sets - we have a larger and smaller set and both are equally popular. All these items are packed in quality packaging. 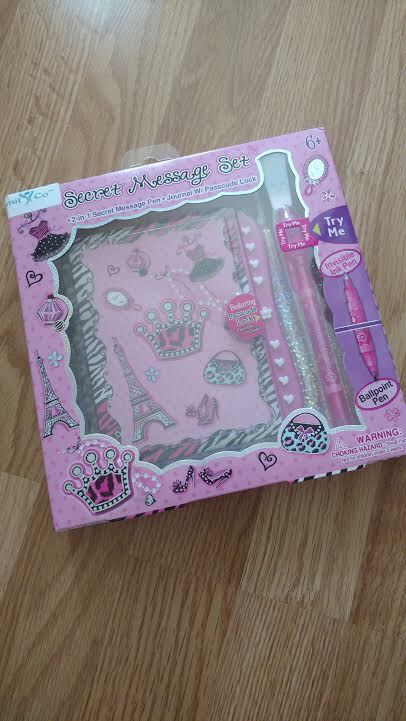 We chose the very cute Diary For Girls a Secret Blank Journal/Notebook Set With Passcode Lock And Invisible Ink Pen With Black Light Top To Keep Her Secrets Safe In a Diva Design! 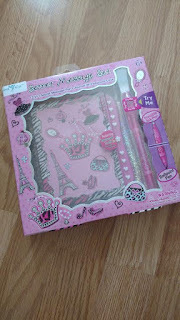 It is all pink and frilly and comes with a dual purpose pen. It is part ballpoint pen and part invisible ink pen! The end of the pen has a blue light to be able to read the invisible ink. I know my kiddo is going to have so much fun with this! On top of that fun the journal also locks and unlocks with a secret code. Now she can keep her thoughts safe from her siblings! I think this would make a wonderful and fun gift for those budding writers and/or artists in your family. Plus added fun with a bit of a spy element! SmitCo has an amazing selection for all your holiday needs. I am loving so many things in their store! I am already checking out their dress up sets and jewelry! Get 15% Off Entire Cart Of Gifts! Check here!